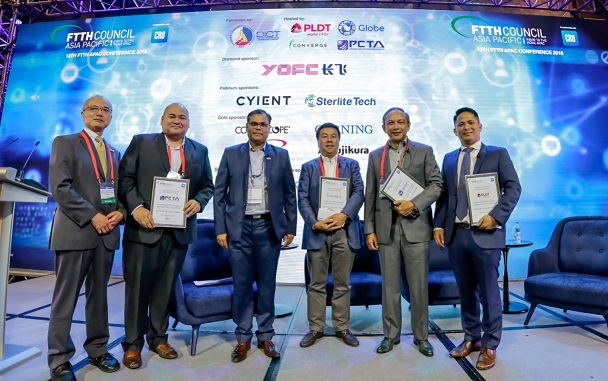 Telco leader PLDT outlined its nationwide fiber network rollout efforts at the recent FTTH APAC Conference held at the Shangri-La at The Fort. "As the preferred digital partner of Filipinos, we understand how access to mobile data and internet speed can make a huge difference in their lives,” said PLDT SVP and Head of Consumer Business Market Development Oscar A. Reyes Jr., who took the podium on the second day of the conference. "Our network expansion and modernization programs represent our commitment to bring high-speed internet to more Filipino homes. PLDT, Globe, and Converge ICT come together at the first FTTH Asia-Pacific Conference in Manila. (L-R) FTTH Asia Pacific Council President Wataru Katsurashima; Philippine Cable Television Association Inc.(PCTA) Executive Director Joel E. Dabao; FTTH Asia Pacific Council Vice President Arvind Mishra; Converge ICT CEO Dennis Uy, Globe Telecom Chief Technology Officer Gil Genio; and PLDT and Smart SVP and Consumer Business Market Development Head, Oscar A. Reyes, Jr. The last few years have seen PLDT leading nationwide network development, rolling out the country's first fiber-to-the-home (FTTH) network and embarking on a massive modernization drive that has transformed its legacy copper-based broadband grid into the much-faster hybrid fiber connection. With the network upgrade plan, PLDT surpassed coverage for 4.1 million homes nationwide by the end of 2017. It expects to provide fixed broadband coverage to over 5.3 million homes and businesses by end of this year, and foresees virtually all of its 1.3 million copper-based DSL subscribers enjoying Fibr-fast internet services by 2019. PLDT's FTTH network rollout is now driving the growth of the country’s fixed broadband speeds. The company has been spearheading the Fibr-powered SmartCity and SmartProvince program to advance fiber connections beyond Metropolitan Manila. This development has so far reached north in Bataan and south in Cavite; extending further to the Visayas at Naga City, Bicol; Toledo City, Cebu; and Mindanao at Cagayan de Oro, General Santos City, Isulan, Sultan Kudarat. The 90-year old telecom conglomerate has introduced the SmartHome, providing customers a convenient suite of Connectivity, Entertainment, Security, and Convergence. Also earlier this year, PLDT's mobile arm, Smart, was also awarded by OpenSignal for having the country’s fastest LTE network with four citations including best in 4G LTE download speed; best in overall download speed; best 4G latency performance; and best 3G latency performance. A mobile analytics firm, OpenSignal uses crowdsourcing and scientific analysis to provide the definitive guide on the outlook of mobile networks across the world. "We strive to work and explore the latest digital innovations for the benefit of every Filipino generation, today and in the future," Reyes added. PLDT hosted the conference which brings together Asia Pacific’s telecom leaders and policy makers to address the socioeconomic benefits of deep fiber and provide a platform for sharing technologies and strategies that have produced real success.